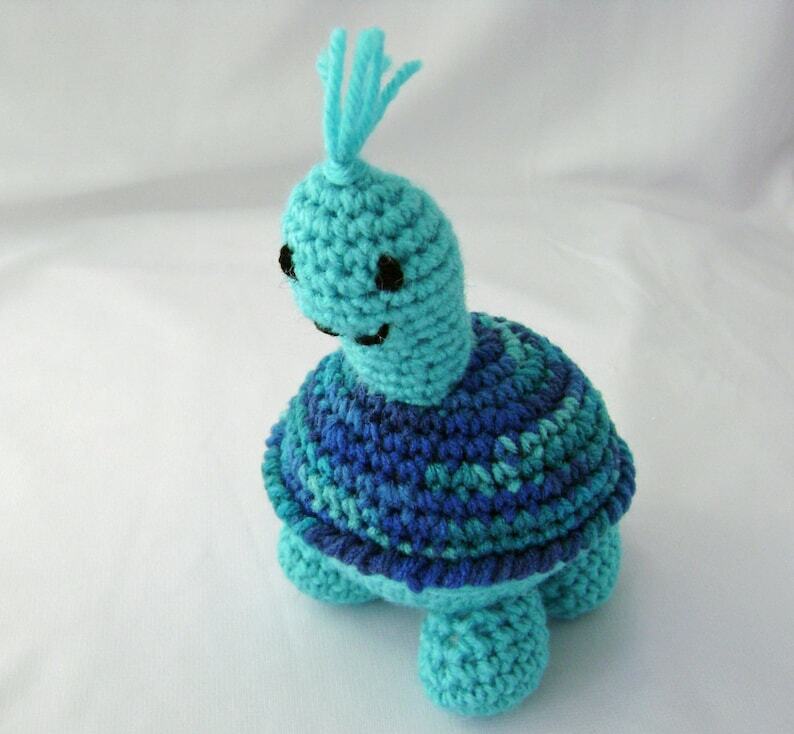 Tyler is one of those rare turtles - he is turquoise! And his shell! Oh my, look at those beautiful shades of blue mixed in with the turquoise. Wouldn't you love to have Tyler become part of your family? I crocheted Tyler using 100% acrylic yarn and stuffed him with polyester fiberfill. He stands about 6.5 inches (16.5 cm) tall and is about 5 inches (12.7 cm) wide. His eyes and sweet smile are embroidered with yarn, so he is child-friendly. Tyler was created in a smoke free, dog loving home, using a pattern designed by Sue of HappyWhosits. Shipping: USPS First Class Mail with Confirmation (where available). I always combine shipping for multiple item purchases made at the same time. See the Shipping & Policy tab for shipping costs. International customers are responsible for any customs duties levied by their country. If you are interested in a different color combination, there are several available in my shop. Or if you would like to place an order for a specific color combination, just contact me via Etsy convo or email to daffodilcornernc [!at] hotmail.com.